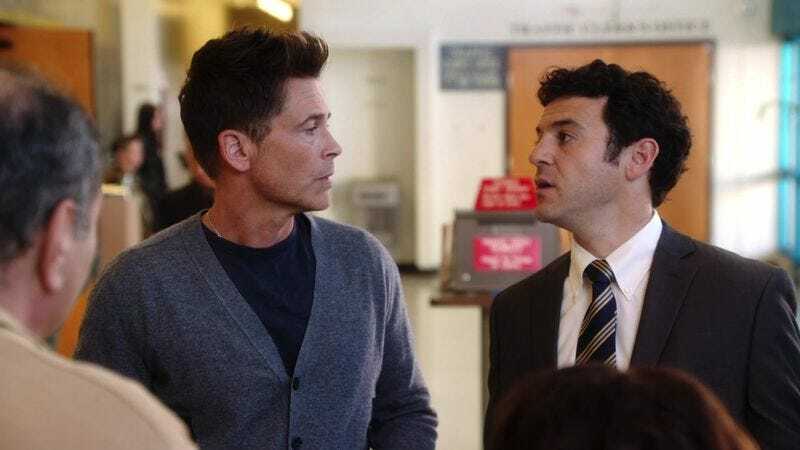 In what will no doubt be merely the opening salvo for a steady procession of jokes about daily life being a grind and some people being unfit for said grinding, there’s been a change atop of the chain of command for Fox’s upcoming comedy The Grinder. According to The Hollywood Reporter, showrunner Greg Malins has exited the freshman sitcom, leaving Fox looking for a replacement as the show’s September 29 premiere date approaches. Starring Rob Lowe and Fred Savage, the new series is being exec produced by creators Andrew Mogel and Jarrad Paul along with Nicholas Stoller and Jake Kasdan, the latter of whom also directed the pilot. Supposedly, this many-headed hydra of a creative team made being showrunner a little difficult, in a case of “too many cooks spoil the process of pointing a camera at Rob Lowe and making it funny.” As a result, Malins stepped down, and is returning to development. Malins follows the showrunners of three other new series who have also stepped down before a single regular-season episode of their shows aired, including the creative leads of NBC’s Chicago Med and ABC’s The Catch and Blood And Oil. Four former showrunners, all of whom left their respective series, now sharing an apartment while scrambling to make a go of it in the City of Angels? Sounds like a can’t-miss sitcom.